Hope you can come Trevor well love to see you! Today is an amazing day in the Washington Seattle Mission!!! We have been trying for two years to get 100 baptism in one month. President Larkin has promised that when we do he will climb Mt. Si and plant our ensign to the nations!! We are in the best place ever to do so!! God has blessed us and refined us in the furnace of affliction and humbled us enough and chastened us enough that we are humble before god and are willing to change and become a new mission!! I just can't wait for this month!!! We had a zone meeting just the other day and we introduced a plan called the "REN-TEN" The idea is that the renton stake will find at least 10 people a day that would accept a baptismal date and agree to read, pray, and come to church. If we can do that we will go places we have never ever been before!! We will have 70 new on dates a week and even if only 15% of those people get baptized (which is lower than the average) we as a stake with help over 50 people come into this gospel, repent of their sins, and find true and lasting happiness!!!! I am so excited to go out everyday because i trust that this idea is the mind and will of God and that he will place those people who will progress in our path so we can help them return to God one day!! We had a mission fast from Wednesday afternoon to Thursday afternoon. At the end of the fast President Larkin challenged the mission to put 100 people on date for baptism!!! The most we ever had in one day in the history of our mission was 86. We as a mission went out in faith and found 100 people exactly and placed them on date for baptism!!!! GOD IS AMAZING!!!! I cant imagine how happy God was when he was able to place 100 of his children in our path and had them prepared to accept the challenge to change their life and be baptized!!! I love this gospel and this work and i know that this email seemed a lot like a bunch of numbers but just know that every number represents a person and that person by accepting the commitments we leave with them is beginning to repent and the heavens are rejoicing!! This week has truly been a week of miracles!! Yes, it was coupled with difficult trials, but those fade away in the background of my mind as i view this past week. In June of 2011 Our mission president, President Larkin challenged the mission to baptize 100 souls in one month. Up until this week we had, as a mission baptized 55 people. We needed 45 more to reach our goal. The mission has never, as far as our records go back, baptized 45 people in one weekend before. We were determined to do so!! the mission had 38 solid people to be baptized so we needed 7 more. We had two people on date for this weeked who were looking good to be baptized. This past Sunday a man named Thomas walked into church. He happened to run into the bishop and asked how he could be a part of this church. We taught him and he said that he had been baptized a member in L.A. a couple of years ago and he wanted his non-member wife and son to be baptized. We set up an appointment with him to meet and teach his family and talked to the ward clerk about getting his records here we find out that he has no records and if he was baptized it wasn't recorded so he would need to be re-baptized. We went to our lesson and committed him to baptism for this weekend!!!! (this was on Tuesday) :) We go back on Thursday and we found out he would not be able to be baptized on Saturday because he was going to be in Everett for work all day, after a long pause we asked him if we could baptize him that night, he thought for a few moments and he said YES!!!!! WHOO!!! :) :) :) That night Thomas Johnson was baptized!!! Our on dates for Saturday was Zenaida, she, on Thursday completely backed out and refused to be baptized. We went back on Friday and taught a powerful lesson on baptism and the atonement of Christ and she agreed to be baptized the next day!! That night she passed her interview and everything was amazing!!! We called her Saturday morning to let her know who was picking her up and she dropped us..... she had called her family to invite them to her baptism and they talked her out of it to the point that she refuses to talk to us, and swares she will never let a Mormon into her house again. What i learned from this experience is that Satan is real and he is powerful :( We also had a baptism planned for Sunday evening, His name is Michael, he works on a merchant ship and will be shipped out to sea soon so we need to get him baptized before he leaves. He got off work at 5pm and his baptism was at 7pm. As he was leaving the ship, some kind of machine on the ship broke and he had to stay and fix it so he was not baptized either...... However, The other set of elders in our ward had a HUGE MIRACLE and baptized a lady this last Sunday at 7pm to take the place of Michael. At this point i am not sure how many people were baptized in the mission, i pray that it was 100, but if not we still have tomorrow!!! God will allow us to achieve this if we have faith, as in all things in life, faith proceeds the miracle and the miracle always comes just in time. I love you all so much and thank for you for your prayers and support!!! Talk to you later!! This week was great!! We were given the command to baptize 3 people this past weekend, we failed, but experienced one of the biggest miracles of our lives!! I will try to explain the whole story. We felt prompted to go and try to baptize an 8 yr old kid who is at the vivaos (recent convert family) some weekends and comes to church often. We had no clue where he lives or who his parents were, but we know that they were not members. We drove to the Viva's and Sonny was there! We asked him if he wanted to be baptized today and he said yes, we continued to ask him where he lived and if he knew his moms phone number and stuff like that. All the info we got was that she lived on Holly St in south Seattle and she drives a dark red Durango. We drove up and down holly st 2 times and found nothing. At this point it is around 12pm and our baptism is at 2. We decide that we need some more info from sonny so we head back down to the vivao's when Elder Barnett gets in a turn lane when he is not supposed to, he quickly catches it and gets out of that lane and we ended up right behind a dark red durango. We, with all the faith we possessed decided to follow it. We followed it for 6 or 7 miles all the way down to the wal-mart in Downtown Renton. As we get out i grabbed a blank baptismal record just in case and we ran to the car. We get there and she rolls down the window and we introduce ourselves and she says,"your mormons right?" "yes we are," we reply, "how do you know us?" She then tell us how her aunt june vivao and her family just got baptized and we just beamed haha!! We talked about sonny and how much he loves church and challenged her to let him be baptized that day at 2pm, she thought on it for a minute, (longest minute of my life!) and then agreed!!! I pulled out the baptismal record and she signed it right there!!! We ran and drove as fast as the law would allow back to the vivao's and sonny had been picked up by his grandma and was gone. We drove to the grandmas house and they were no where to be found. Frantically we drove back to walmart to see if the mam was still there and she was, she called the grandma and the grandma said they already had plans and that sonny would not be able to be baptized that day. It was very dissapointing but the mother said that she would keep the 14th of July completely open for sonny to be baptized!!! every minute of that entire morning was guided by the spirit, i am not sure why he didn't get baptized, but he will next weekend!! This week has been great! There were so many miracles!!! There is a ward in the zone that was going to have two baptisms this weekend, two young brothers who were blessed to learn and grow together in the gospel. A week ago i was privilages to interview these two young men and they were solid!! They loved the gospel and everything they were learning, as we call it here they were "Golden." Saturday came and the younger one, carlos, decided he didnt want to be baptized because he was scared of the water. Later on that day he came to the missionaries and asked if he could get baptized, so two hours later he was baptized!! My companion and i were privilaged to go and the most amazing and incredible part of this baptism was when carlos came out, his brother hugged him, asked him how he felt, and told him he would always be there for him, both these boys are younger than 12 and it was teh most amazign thing ever!! There was no program, no special musical number, no talks, not even an opening prayer, but, it was one of the most spiritual baptisms i have ever been to. What a blessing!!! Another miracle that happened was that George Commodore in Skyway was finally baptized!!! WHOO!!! We have been working with him since the first week i arrived in the skyway ward. Through a lot of trial and prayer, we finally got him baptized!! The look on his face as his recent convert friend Ricky pulled him out of the water was priceless!! He knows this is ture and for the first time in his life he has the courage to face life without fear!! One of the strongest spiritual manifestations of the holy ghost happened this week as well. We had a leadership training meeting this last friday at the renton stake center. At the same time the renton stake was putting on a Missionary training two day event. Because we were there we were able to participate in som eof that and teach with these wonderful youth ages 16-22. We all gathered in the chapel to hear a talk by out mission president on the love of God and the Doctrine of Christ, the missionaries sat on the sides of the chapel and the youth in the middle. President Larkin was speaking and he had the youth open to page 1 of Preach My Gospel, he than said "Missionaries of the Washington Seattle mission please stand." we all stood, he then said, "Washingotn Seattle Mission, what is your purpose?" In one voice the leaders of our mission stated our purpose and the spirit flooded the room, tears were rolling, hearts were burning, and hopes and spirits were high. Gods work is the work we are all engaged in and he is at the head of it!! I will never forget that experice and it will sustain me for life! I love you all!! This week has been a great week! We have been struggling to find people who are willing to change. God has led us to a lot of people who have a desire to change but don't have the strength or drive to do so. It had been very frustrating but we still go on! This transfer the lord decided to bless us with two more elders in our ward. Skyway B has arrived!! The elder's names are Elder Jensen and Elder HIll. The live with us and it has been a big change living with two more Elders, lets just say there is ALWAYS dirty dishes hahaha. At least we have two bathrooms haha. God has blessed this mission so much! We have come so far! In the last 12 months we as a mission have baptized 800 people, that is more than the mission has ever donr before! Ourt mission is becoming a holy mission, we are focusing on cleasing and purifying our lives to be worthy of the spirit 100% of the time. We have been teaching a Samoan guy named George Commador. He is fully prepared, living all the commandments, and coming to church, but just wouldnt ever get baptized, we were stumped. we sent the Skyway B elder over there and they put him on date for tis saturday!!!!!!!!! WHOO!!!! There is also a man names shawn, he is the bishops nephew, he has come to church the past 5 weeks in a row, we have taught him once. When we taught him last week we gave him a chapter in Alma to read. He came to us at church and he asked us "When can I be Baptized?" God is preparing all of his children to return and live with him!! God loves us all and wants us to be with him! I know that this is Gods work and that he did restore his church to the earth, Joseph Smith is a prophet and teh Book fo Mormon is a pure source of revelation on the earth!! I am so excited and I Love you all so much!! Bye!! Tiffany Campbell was also baptized and confirmed this weekend!! The ward, in particular, two sisters wrapped her in the arms of love and made it possible for her to overcome many addictions and bad habits she has done her whole life and remarkably she was baptized in just over 3 weeks, fully committed and converted to the gospel of Jesus Christ!! Truly a miracle only God could preform!! This transfer was awesome because we are in a Tri-panionship!! 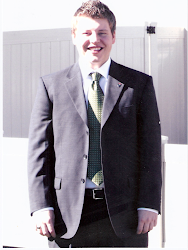 (there is 3 of us) Elder Johnson is going home in June, this is his last transfer and he had been struggling a bit. Something happened to him and he is the most motivated, inspired, and inspiring missionary i have served around in my whole mission!!! For Example: We don't run from door to door anymore, we sprint. We were tracting an apartment building and there was an apartment building next to the one we were in and we were separated by a parking lot. There was a lady who came out on her balcony of the apartment building next to ours. Elder Johnson looked and her for a while and then walked over to the balcony of the apartment building we were in and yelled "we are missionaries and we teach about Jesus Christ, can we come over and teach you!?" She stared for a few min and then motioned him over. We finished the door we were knocking and ran down to the parking lot of the apartments there were two people in the parking lot so Elder Barnett and I each talked to one of them and Elder Johnson ran to a 6 foot wooden fence and with the help of a rock wall jumped over it and ran to teach this lady he had yelled at. By the time Elder Barnett and I hopped the fence and ran up to him it was dead silent and she was crying, she needed God at that moment and Elder Johnson heeded the call, she is a new investigator and we will be teaching her on Friday!! Elder Trevor Williamson Mailing address: Elder Trevor Clifton Williamson Washington Seattle 10675 Northeast 20th Street Bellevue, WA 98004 PLEASE WRITE TO ME,I want to know how you guys are doing!! !